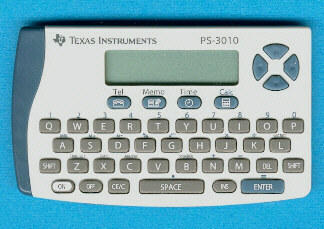 The PS-3010 Databank combines a full keyboard with a very small housing. The specifications are identical with the PS-2000 and PS 20/20. The display of the PS-3010 consists of one line for alphanumeric characters and one line supporting only numbers. The design of the PS-3010 fits neatly with the PS-2400+. Comment by the author: The designation PS-3010 for this Databank makes no sense to us. All other products specify with the first digit the number of display rows, e.g. the PS-2100 sports two lines and the PS-3600 featuers three lines. The leading "5" gives a Translator and the leading "6" an Organizer. © Joerg Woerner, July 22, 2002. No reprints without written permission.